The Martini. Gin, dry vermouth. It’s an incredibly simple cocktail with a complex history. For generations, it has represented sophistication, style, elegance, and perhaps a bit of debauchery. The origins are a bit fuzzy, surrounded by myth and legend – must have been all the martinis. Some claim the martini originated in California during the gold rush, others say an Italian immigrant named Martini invented the drink at the Knickerbocker Hotel in New York. The first published recipe was in 1884 in The Modern Bartender’s Guide, but the drink would be barely recognizable today. It was referred to as the Martinez (which people in Martinez, California would say proves it originated there) and called for equal parts of gin and sweet vermouth, and 2 dashes of orange bitters. 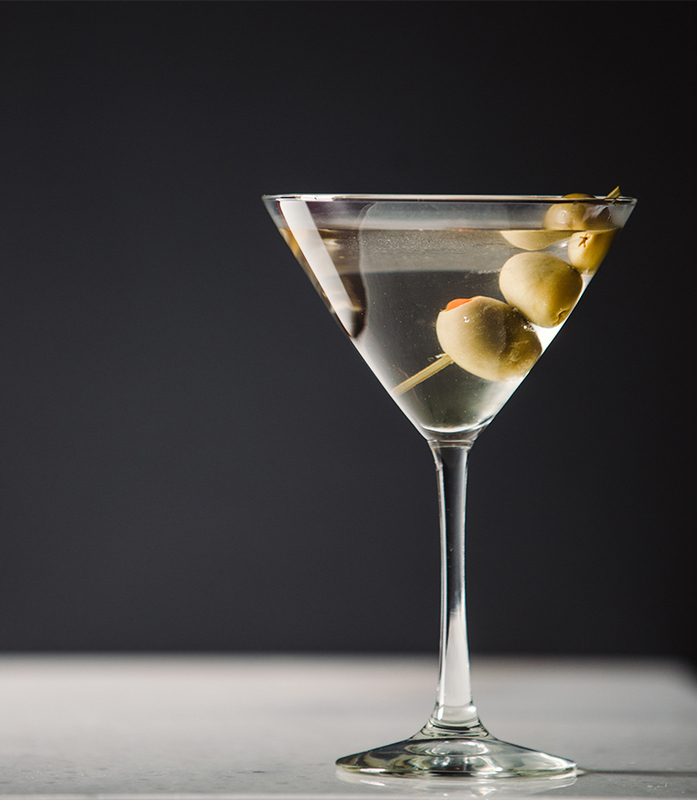 By the first decade of the 20th century, the martini had evolved into something much closer to the drink we enjoy today. Sweet vermouth had been replaced with dry and the bitters were sometimes excluded, but the 1:1 ratio of gin to vermouth remained. By the 1920s, the iconic V-shaped martini glasses had emerged. However, prohibition changed drinking habits drastically. Whiskey had been America’s most popular spirit, but the complex distillation and aging process became too difficult during prohibition, so people resorted to making gin, stiff and unpalatable, but gin nonetheless. Even after prohibition, the quality of gin didn’t improve very much. So by the 1940s and 50s well-made vodka slowly began to replace poor gin as the prefered spirit in the martini. Also during this time, the use of bitters disappeared, and the ratio of gin to vermouth changed to 2:1 or 3:1, making the drinks drier. Now that you’ve been enlightened on the martini of the past, let’s explore how to order one in the present. Today, gin is still technically the “correct” ingredient in a martini, but vodka martinis are ordered so often that very few bartenders would assume you want your martini with gin. Whatever spirit you prefer, you’re going to get more of it in your martini than you would several decades ago. Stir vermouth and gin (or vodka) over ice cubes in mixing glass. Strain into cocktail glass. Serve with a twist of lemon peel or olive, if desired. Garnished with an olive or a lemon twist. The good news is, there is no right answer for the above questions, it’s all up to you. I personally love my martinis with botanical gins, stirred, served up, with a twist. Although James Bond would disagree, I ask for my martinis to be stirred rather than shaken. When shaking a cocktail, the ice will be broken more and dilute the cocktail more than gentle stirring will. Similarly, I like drinking my martinis up because while ice will keep it cold, it will dilute the martini as you drink it. I prefer a lemon twist because it brightens up the drink and provides another layer of flavor. Personally, I don’t understand olives in a martini. I find myself wondering why my cocktail was served with a snack inside it, but many people prefer it. Another common variation is the dirty martini, which replaces the vermouth with olive juice and is garnished with an olive. Order it extra dirty for more olive juice or slightly dirty if you want less olive juice. Do yourself a favor though and don’t drop the extra couple bucks for premium alcohol in a dirty martini. The olive juice will cover up the subtleties of nicer vodkas and gins, so to be economical just stick to the basics. However you decide to drink your martini, let it be with confidence, class, good company and a generous tip to your bartender! Andy has experience as a bartender at many restaurants and cocktail bars in New York City including Temple Bar and The Lotos Club. His favorite cocktail is the Negroni, but he also enjoys honoring his Kentucky roots and sipping on a nice bourbon. Neat, of course.